Locations of INE and CAT-ACT beamlines with their experimental hutches dedicated for the investigation of radioactive materials at the east side of the KARA accelerator building. Synchrotron radiation based speciation techniques have become key methods in basic and applied radionuclide research. 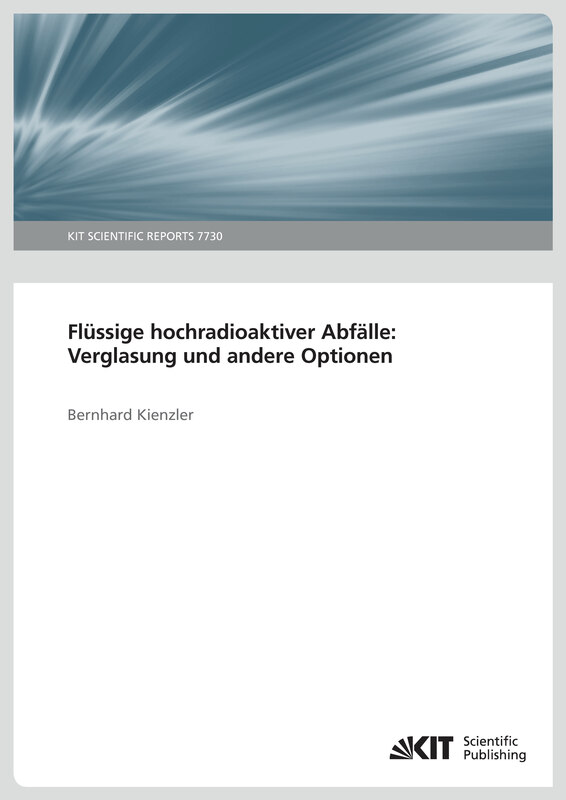 In the context of Germany’s nuclear energy phase-out and “energy transition” to renewable resources, this development is primarily driven by the need to secure molecular-scale understanding of (geo-)chemical processes determining the mobility of safety relevant radionuclides (long-lived actinides, fission and activation products generated during nuclear reactor operation), possibly released from a projected disposal site for highly active, heat-producing nuclear waste. About 15 years ago, construction of the INE-Beamline for actinide science at the ANKA light source (now the KArlsruhe Research Accelerator KARA) commenced and marked the beginning of synchrotron radiation based radionuclide research at the KIT synchrotron. The INE-Beamline and ACT station at the CAT-ACT beamline belong to the exclusive club of a few synchrotron beamline facilities in the world - mostly located in Europe - dedicated to the investigation of highly radioactive materials in the context of the nuclear waste disposal safety case as well as basic and applied actinide/radionuclide research. Since commissioning of the INE-Beamline in 2005, capabilities for synchrotron-based radionuclide and actinide sciences at KIT have been continuously expanded, driven by KIT or HGF in-house research programs and by external user needs. A recent publication the Geosciences special open access issue on “The Development and Use of Synchrotron Radiation Techniques for the Geological Disposal of Radioactive Wastes” (Geosciences 2019, 9, 91; doi:10.3390/geosciences9020091) summarizes the past 15 years of XAFS-based radionuclide research at KIT and highlights some examples for recent or ongoing research at the local synchrotron source. 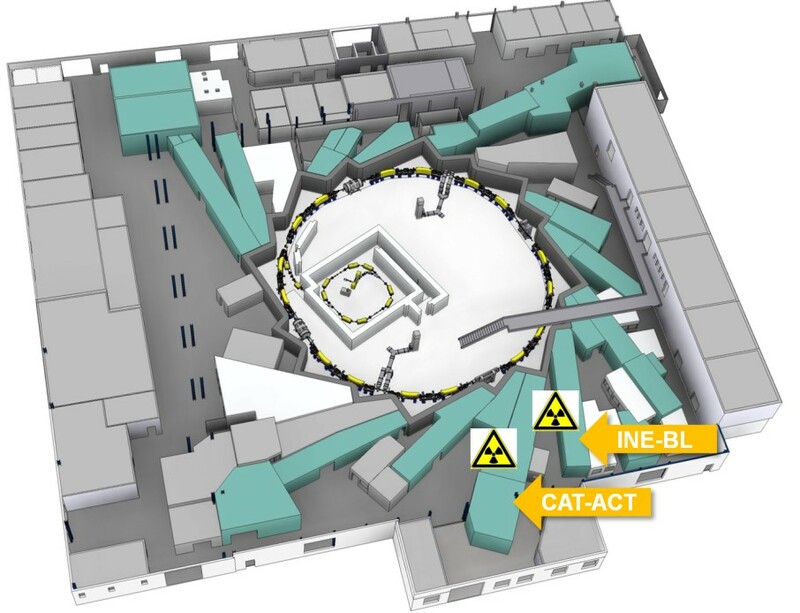 The image depict the locations of INE and CAT-ACT beamlines with their experimental hutches dedicated for the investigation of radioactive materials at the east side of the KARA accelerator building. Die deutsche Sektion der international tätigen Organisation „Women in Nuclear“ (WiN Germany) hat ihren Jahrespreis 2018 an die derzeit am KIT im Institut für Nukleare Entsorgung (INE) promovierende Nachwuchswissenschaftlerin Bianca Schacher vergeben. 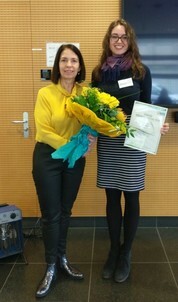 Frau Schacherl hat die Jury mit ihrer Master-Arbeit mit dem Titel "Structural investigation of Np interacted with illite by HR-XANES and EXAFS” beeindruckt. Women in Nuclear ist eine weltweite Organisation von Frauen, die in den unterschiedlichsten Berufsfeldern mit dem Thema Kernenergie und Strahlenschutz – auch in der Medizin – in Berührung kommen und sich zum Ziel gesetzt haben, die Öffentlichkeit über diese Themen zu informieren. WiN Global hat bisher über 25.000 Mitglieder in 107 Ländern. 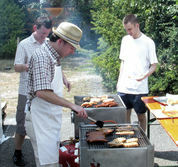 Die deutsche Sektion wurde 2008 als gemeinnütziger Verein gegründet. Das Foto zeigt die Preisübergabe an Bianca Schacherl durch Jutta Jené, Präsidentin von WiN Germany. „Röntgenabsorptionspektroskopie und Katalyseforschung – eine ideale Symbiose“ und Röntgenspektroskopie und der Nukleare Brennstoffkreislauf“ – so lauteten ins Deutsche übertragen die Titel der beiden eingeladenen Plenarvorträge im Rahmen eines zweitägigen internationalen Workshops anlässlich der Inbetriebnahme der CAT-ACT-Strahlführung an der Synchrotronstrahlungsquelle auf dem Campus Nord des KIT. 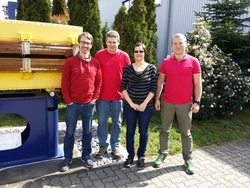 Dass die an dieser neuen „Beamline“ mit zwei hintereinander geschalteten Messlaboratorien zur Katalyse- (CAT) bzw. Radionuklidforschung (ACT) zur Anwendung kommende Röntgenabsorptionsspektroskopie (XAS) ein ideales Werkzeug in zwei essenziellen Forschungsgebieten bei der Bewältigung der deutschen „Energiewende“ darstellt, war die Quintessenz mehrerer Redner der Veranstaltung. Eröffnet wurde der Workshop durch den Leiter des Forschungsbereichs 5 „Mathematik und Physik“ am KIT, Prof. Dr. Johannes Blümer. Anschließend diskutierten etwa 60 nationale und internationale Forscherinnen und Forscher über die neuen Möglichkeiten der beiden Messplätze am Karlsruher Beschleuniger KARA, dessen Doppelfunktion als Synchrotronstrahlungsquelle und Testplattform für Beschleunigerkomponenten von der Leiterin des Instituts für Beschleunigerphysik und Technologie (IBPT), Prof. Dr. Anke-Susanne Müller, eingangs vorgestellt wurde. Auf eine kurze Präsentation der neuen Beamline und ihrer Messmöglichkeiten (Prof. Dr. Jan-Dierk Grunwaldt, ITCP/IKFT, Dr. Jörg Rothe, INE) und erster im Rahmen der Inbetriebnahme durchgeführten Untersuchungen (Dr. Anna Zimina, IKFT, Dr. Henning Lichtenberg, ITCP, Dr. Tonya Vitova, INE) folgten 12 nationale und internationale Fachbeiträge abwechselnd aus beiden Themenfeldern, die das Potential der XAS-Technik im Rahmen von in situ / operando Studien katalytischer Prozesse oder der notwendigen Speziation von Radionukliden (Actiniden und langlebige Spalt- und Aktivierungsprodukte) zur Vorhersage ihres langfristigen Verhaltens in einem Endlager für nukleare Abfälle beleuchteten. Sowohl Prof. Ronald Frahm (Universität Wuppertal) als auch Prof. Peter Pfeifer (KIT) schwärmten von den neuen Möglichkeiten, die CAT-ACT bietet, um einem Katalysator „bei der Arbeit“ zuzuschauen und so z.B. ganz neue Einblicke in grundlegende Prozesse zur chemischen Energiespeicherung zu erhalten. Darüber hinaus beschrieben Prof. Melissa A. Denecke, wissenschaftliche Direktorin des Dalton Instituts der Universität Manchester und Prof. Tobias Reich, Leiter des Instituts für Kernchemie an der Universität Mainz, einzigartige Möglichkeiten, um durch XAS-Messungen die chemisch-physikalische Struktur von Actinid-Verbindungen aufzuklären - ein wesentlicher Baustein für den Langzeitsicherheitsnachweis eines zukünftigen nuklearen Endlagers. Bereichert wurde der Workshop nicht nur durch Beiträge internationaler Redner sowie aktiver und zukünftiger Anwender, sondern auch durch industrielle Nutzer der Messlinie – etwa des dänischen Katalysator- und Engineering-Unternehmens Haldor Tospsoe A/S – und nicht zuletzt durch eine Präsentation des Hauptlieferanten der Beamline-Komponenten, der britisch-deutschen Firma FMB Oxford. Flüssige hochradioaktiver Abfälle: Verglasung und andere Optionen. Schwach- und mittelradioaktive Abfälle: Organische Matrices. of materials which might be suitable for construction of containers for highly radioactive wastes. The report relates almost exclusively to the work performed by Dr. Emmanuel Smailos, who elaborated the corrosion of various materials at the Institute for Nuclear Waste Disposal (INE). The requirements for the containers and materials, which were subject to changes in time, are presented. The changes were strongly influenced by the changed perception of the use of nuclear energy. steel, Hastelloy C4, nodular cast iron, titanium-palladium and copper or copper-nickel alloys in typical salt solutions are summarized. The findings of special investigations, e.g. corrosion under irradiation or the influence of sulfide on the corrosion rates are shown. 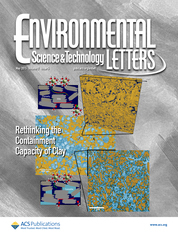 For construction of disposal canisters, experiments were conducted to determine the contact corrosion, the influence of the hydrogen embrittlement of Ti-Pd and fine-grained steels on the corrosion behavior as well as the corrosion behavior of welding and the influence of different welding processes with the resulting heat-affected zones on the corrosion behavior. 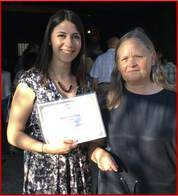 The work was contributed to several European research programs and was well recognized in the USA. Investigations on the corrosion of steels in non-saline solutions and corrosion under interim storage conditions as well as under the expected conditions of the Konrad repository for low-level radioactive wastes are also described. In addition, the experiments on ceramic materials are presented and the results of the corrosion of Al2O3 and ZrO2 ceramics, steatite porcelain as well as of silicon carbides are described. 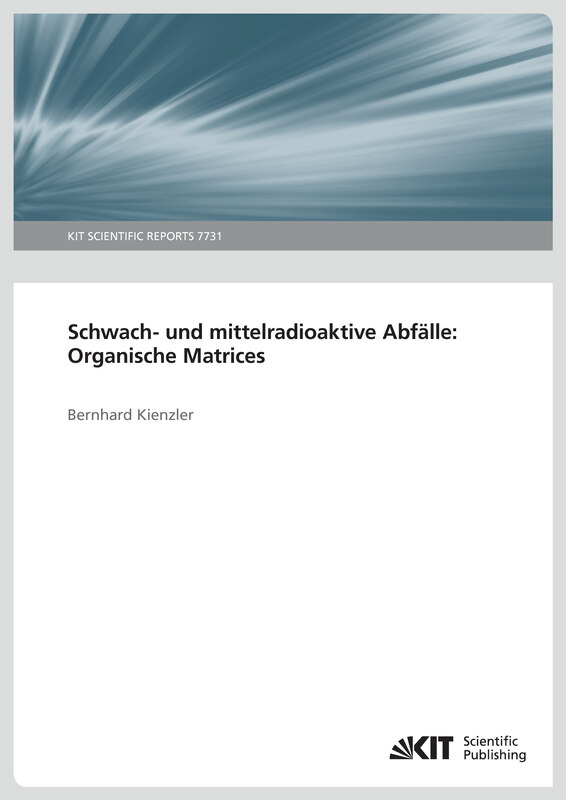 The present work provides an overview of the use of organic matrices for the fixation of low- and medium- radioactive wastes from various fields of nuclear technology. It is true that the incorporation of these waste into cement was and is a simple, cost-effective and widely used method. However, cement also has some disadvantages, such as the increase in the waste volume, a delayed setting and the associated separation of water and solids. Therefore, organic matrices such as bitumen, polyethylene, and other plastics have also been used for certain waste streams. This summary provides an overview of the results of R&D work and the use of organic matrices, mainly in the 1980s. The wastes suitable for fixation in organic matrices and the treatment methods are described. The properties of the resulting waste products are summarized, with respect to their physical properties, radiolysis gas formation, combustibility as well as the leaching behavior and the swelling processes in the case of bitumen are described. An overview of the microbial degradation of bitumen is also given. A problem of the organic matrices, in particular the bitumen, is its combustibility. Fires occurred in various bituminizing plants and are evaluated as far as information is available. Nuclear Technology, Vol. 198, pp. 260-276, 2017. A consortium of 10 partners from seven European countries and the European Commission collaborated in investigating the short-term release of radionuclides from disposed spent nuclear fuel upon canister failure. The Collaborative Project FIRST-Nuclides was implemented in the scope of the 7th Euratom Framework Programme in the period from 2012 to 2014. The objectives and organization of the project are presented, as well as the experiments with highly radioactive materials under investigation. 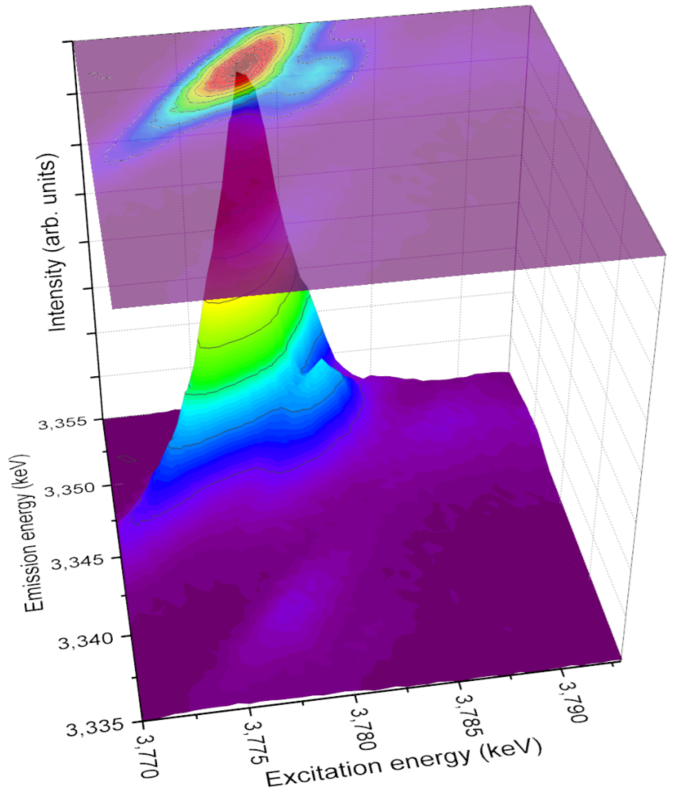 The outcome of the project summarizes the measured instant release fraction (IRF) of safety-relevant isotopes from high burnup spent UO2 nuclear fuels (SNFs). Specifically discussed are the dependencies of the IRF on the sample properties, the gap and grain boundary releases, and the behavior and IRFs of elements such as cesium, iodine, and selenium. The IRFs of nonstandard SNFs were also investigated. The summary is complemented by the presentation of the modeling approaches within the project. Figure. A schematic view of the AnO22+ molecules (An = U, Np or Pu) investigated with An M4,5 edge HR-XANES/RIXS. From U to Pu the electronic population of the An 5f states increases (5f0 > 5f1 > 5f2) but their sensitivity to changing bonding partners decreases. The PuO22+ RIXS map depicts an example of an energy shift correlated with rising localization of the An 5f states (U < Np < Pu) http://rdcu.be/tYav. One of the long standing debates in actinide chemistry is the level of localization and participation of the actinide 5f valence orbitals in covalent bonds across the actinide series. Researchers from the Institute for Nuclear Waste Disposal (INE), KIT illuminate the role of the 5f valence orbitals of uranium, neptunium and plutonium in chemical bonding using advanced spectroscopy techniques: actinide M4,5 HR-XANES and 3d4f RIXS applied at the beamline for actinide research (INE-Beamline) at the ANKA synchrotron radiation facility, KIT. The experimental results are supported by theoretical calculations performed by scientist from the University of Nord Texas, USA and CNRS, France. 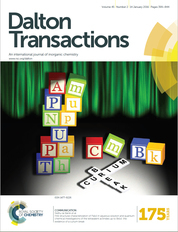 Results reveal that the 5f orbitals are active in the chemical bonding for uranium and neptunium, shown by significant variations in the level of their localization evidenced in the spectra. In contrast, the 5f orbitals of plutonium appear localized and surprisingly insensitive to different bonding environments. 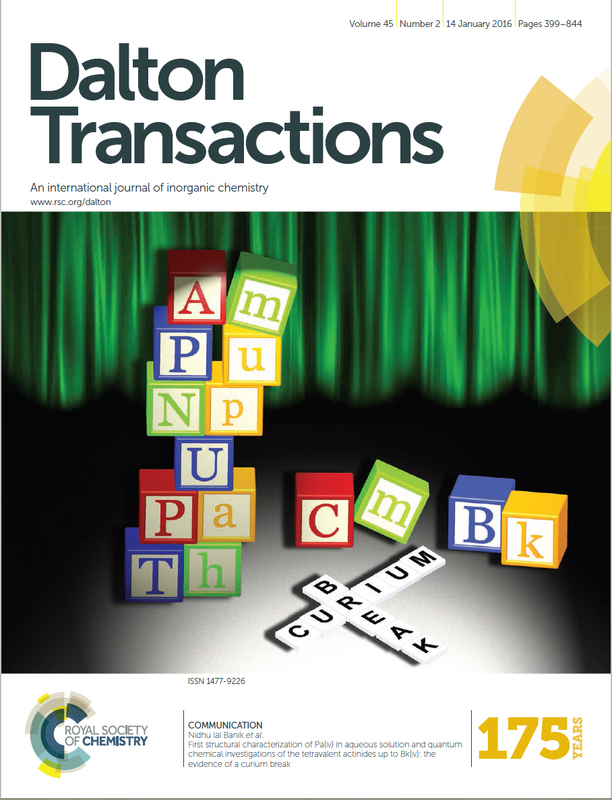 This report of using relative energy differences between the 5fd/f and 5fp*/5fs* orbitals as a qualitative measure of overlap-driven actinyl bond covalency will spark activity, and extend to numerous applications of RIXS and HR-XANES to gain new insights into the electronic structures of the actinide elements. properties. However, glasses and especially high-purity glasses such as fused silica glass are notoriously difficult to shape, requiring high-temperature melting and casting processes for macroscopic objects or hazardous chemicals for microscopic features. These drawbacks have made glasses inaccessible to modern manufacturing technologies such as three-dimensional printing (3D printing). Using a casting nanocomposite, here we create transparent fused silica glass components using stereolithography 3D printers at resolutions of a few tens of micrometres. The process uses a photocurable silica nanocomposite that is 3D printed and converted to high-quality fused silica glass via heat treatment. The printed fused silica glass is non-porous, with the optical transparency of commercial fused silica glass, and has a smooth surface with a roughness of a few nanometres. By doping with metal salts, coloured glasses can be created. This work widens the choice of materials for 3D printing, enabling the creation of arbitrary macro- and microstructures in fused silica glass for many applications in both industry and academia. Ausgehend von den politischen und gesellschaftlichen Randbedingungen werden die Forschungs- und Entwicklungsarbeiten zur sicheren Endlagerung radioaktiver Abfälle, wie sie im Kernforschungszentrum Karlsruhe im Institut für Nukleare Entsorgung durchgeführt wurden, zusammengestellt. Die Organisationformen und die jeweils wesentlichen Forschungsthemen werden genannt sowie die gegenwärtigen Forschungsthemen und die Einbindung des Instituts in Lehre und Ausbildung und in Beratungsaufgaben. Autoren: B. Kienzler, Ch. Borkel, V. Metz, M. Schlieker. Radioaktive Abfälle aus der Pilot-Wiederaufarbeitungsanlage WAK wurden in der Schachtanlage Asse II eingelagert. Ein großer Teil der Abfälle bestand aus zementierten NaNO3-haltigen Lösungen. Zur Untersuchung des Langzeitverhaltens dieser Abfälle wurden Experiment mit simulierten Abfallprodukten im Maßstab 1 zu 1 in relevanten Salzlösungen bis 2013 durchgeführt. Die im vorliegenden Bericht dargestellten Ergebnisse beinhalten die Lösungsentwicklungen und die chemische und mineralogische Charakteristiken der Festphasen einschließlich der Radionuklide, anderer Abfallkomponenten und der Paragenese der Festphasen (Korrosionsprodukte). Prof. Geckeis erläutert das Forschungsprogramm des INE. Von links: V. Schulze (WBK), M. Nasse (IBPT), R. Ruprecht (IBPT), Botschaftsrat J.-J. Pierrat, H. Geckeis (INE). Zum Abschluss seines eintägigen Besuchs des KIT am 24. November 2016 informierte sich der französische Botschaftsrat für Forschung und Technologie, Herr Jean-Jacques Pierrat, über aktuelle Projekte an der Synchrotronstrahlungsquelle ANKA auf dem Campus Nord. Koordiniert wurde das Besichtigungsprogramm durch Manuella Werp - seit kurzem verantwortlich für French-German Relations in der Dienstleistungseinheit International Affairs (INTL). Herr Pierrat wurde im Ost-Anbau der ANKA-Halle durch Michael Nasse und Robert Ruprecht vom Institut für Beschleunigerphysik und -technologie (IBPT) begrüßt, die ihm zunächst anhand des dort aufgestellten Modells der ANKA-Beschleunigeranlage einen kurzen Überblick über ANKA, das betreibende Institut IBPT und die Einbindung in die Forschungslandschaft des KIT boten. Fortgesetzt wurde die Präsentation im Kontrollraum der 2016 erfolgreich in Betrieb genommenen neuen Strahlführung „CAT-ACT“, die in alternierend von den KIT-Instituten ITCP/IKFT sowie INE genutzten Messlaboren hochpräzise spektroskopische Untersuchen an aktiven Katalysatoren („CATalysis research“) bzw. hochradioaktiven Kernmaterialien („ACTinide research“) mittels intensivem Synchrotronlicht in einem weiten Energiebereich ermöglicht. Herr Nasse erläuterte zunächst die verschiedenen Aufgaben des IBPT, zu denen neben dem Betrieb des ANKA-Speicherrings als Synchrotronstrahlungsquelle auch die Entwicklung neuartiger Beschleunigersysteme wie der im Bau befindlichen Testanlage FLUTE und von Strahldiagnostik-Tools für Teilchenbeschleuniger gehört. Ein Alleinstellungsmerkmal besitzt ANKA mit dem Betrieb von mittlerweile zwei Messplätzen (INE-Beamline und ACT-Labor) zur Untersuchung der chemisch-physikalischen Strukturen hochradioaktiver Probensysteme mittels verschiedener röntgenspektroskopischer Verfahren. 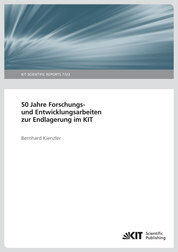 Das Forschungsprogramm des hierbei verantwortlichen Instituts für Nukleare Entsorgung (INE) und die Bedeutung der ANKA-Anlage für die Erforschung von Konzepten zur Behandlung und Endlagerung radioaktiver Abfälle wurde von Horst Geckeis, Leiter des INE, vorgestellt. Jörg Rothe erläuterte die Messmöglichkeiten an beiden Beamlines, deren besonderer Standortvorteil in der direkten Anbindung an die radiochemischen Labors des INE auf dem Campus Nord des KIT besteht. Zum Abschluss des Besuchs unterhielt sich Herr Pierrat noch kurz mit Wissenschaftlern des französischen CEA Cadarache (Commissariat à l’énergie atomique et aux énergies alternatives), das als externer Kooperationspartner regelmäßig die Messmöglichkeiten für radioaktive Probensysteme an ANKA nutzt. Vom 26. - 28. September 2016 fand in Köln die von der Deutschen Arbeitsgemeinschaft Endlagerforschung (DAEF) veranstaltete 2. Konferenz „Key Topics in Deep Geological Disposal – Challenges of a Site Selection Process: Society – Procedures – Safety“ statt. Die DAEF ist ein Zusammenschluss deutscher Einrichtungen (unter dem derzeitigen Vorsitz des KIT), deren Forschungsaktivitäten überwiegend im Bereich der Tiefenlagerung radioaktiver Abfälle liegen. Der Fokus der DAEF liegt auf der sicheren Entsorgung von radioaktivem Abfall und der stetigen Weiterentwicklung der damit verbundenen wissenschaftlichen und technischen Expertise unter Einbezug von sozioökonomischen Themen. Dazu gehören auch wissenschaftliche Fragestellungen im Hinblick auf ein Auswahlverfahren für einen Standort zur Tiefenlagerung. Im Rahmen der Konferenz wurde anhand von Übersichtsvorträgen der aktuelle Kenntnisstand zu zentralen Aspekten der Endlagerforschung vorgestellt. Dabei wurden, wie auch im Rahmen der 1. DAEF-Konferenz, sozioökonomische und soziotechnische Themen einbezogen. Der Fokus der diesjährigen Konferenz lag auf der Arbeit der „Kommission Lagerung hoch radioaktiver Abfallstoffe“. Im Rahmen einer eigenen Session stellten ehemalige Mitglieder der Endlagerkommission ihre Arbeit vor. Die internationale Sichtweise wurde durch einen Schweizer Experten vorgestellt. Wissenschaftlerinnen und Wissenschaftler aus verschiedenen Nationen präsentierten ihre eigenen Arbeiten ausführlich im Rahmen von Vorträgen und Posterbeiträgen. Erstmalig wurden die exzellenten Arbeiten der Nachwuchswissenschaftler durch die Vergabe von 3 Posterpreisen gewürdigt. 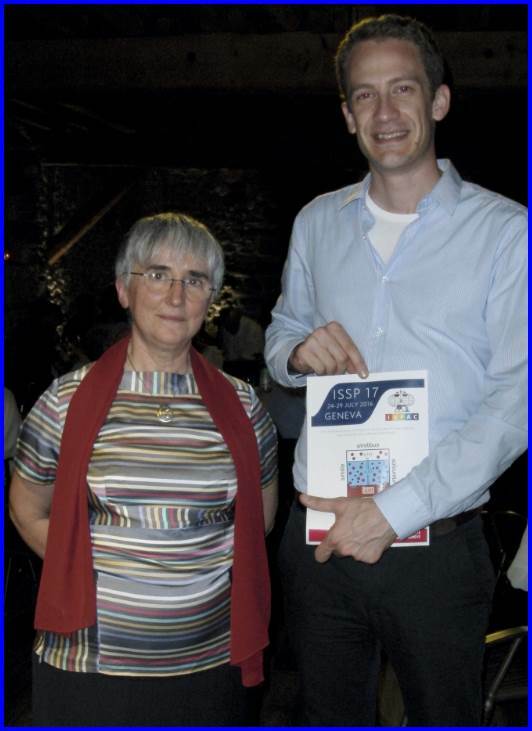 During the ISSP17 Conference (24-29.07.2016, Geneva, Switzerland), Dr. David Fellhauer of KIT-INE received the international Franzosini Award 2016 from Prof. C. Magalhaes. The Franzosini award is given to Dr. Fellhauer in view of his outstanding scientific work on actinide solubility and thermodynamics in aquatic systems relevant to nuclear waste disposal. The Franzosini Award is given biannually by the IUPAC Subcommittee on Solubility and Equilibrium Data (SSED) to an excellent young scientists. The IUPAC SSED coordinates projects in the area of compilation and critical evaluation of published experimental data on the chemical solubility of well defined substances and other equilibrium systems. Dr. Yalcintas was rewarded a Poster-Award for her work on „solubility of UO2(am,hyd) in alkaline carbonate solutions“ at the ISSP17 Conference in Geneva, Switzerland, by the local organiser Dr. Montserrat Filella. The work of Dr. Yalcinats on uranium(IV) chemistry and thermodynamics in aqueous solutions is integrated into the BMWi funded EDUKEM project. ISSP is an established bi-annual conference series organised by IUPAD SSED, aiming at discussing and promoting the study of solubility phenomena and related equilibrium processes. The Royal Society of Chemistry awarded the prestigious Royal Society of Chemistry Becquerel medal to Prof. Dr. M.A. Denecke. 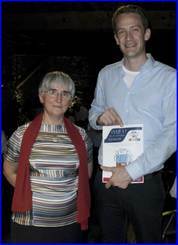 Prof. Denecke was senior scientist at the INE before she was appointed co-director of the Dalton Nuclear Institute at the University of Manchester. Congratulations from the entire INE-team! 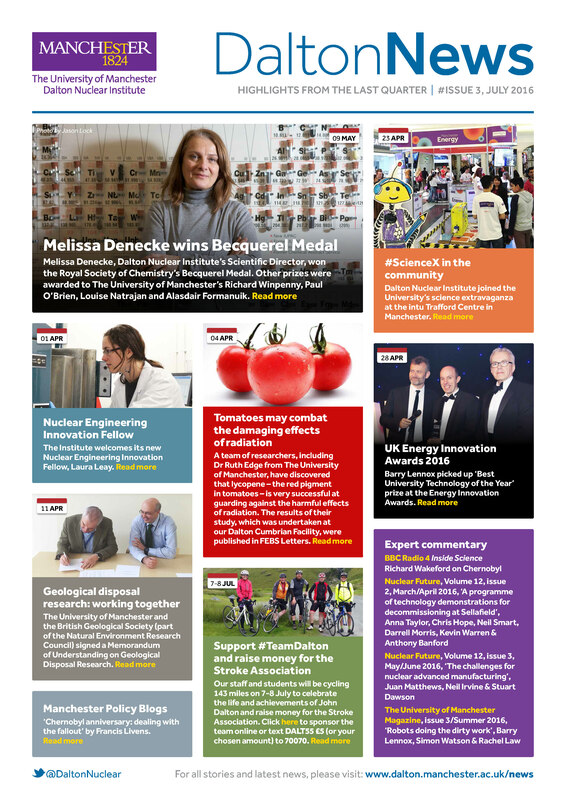 The latest edition of Dalton News is available here. The 1st Annual Workshop of the CEBAMA project was held on 11th–13th May 2016, in Barcelona, Spain, hosted by Amphos21. The workshop was well attended by 60 participants coming mainly from the Project Beneficiaries but also members of the CEBAMA End-User Group. The CP CEBAMA is coordinated by KIT-INE and addresses key issues of relevance for long term safety and key scientific questions related to the use of cement-based materials in nuclear waste disposal applications. The project is implemented by a consortium with 27 Beneficiaries from EURATOM Signatory States, Japan and Switzerland. National Waste Management Organizations contribute to the running project by participation in the End-User Group, by co-funding Beneficiaries, and provide for knowledge and information transfer. The 1st Annual Workshop of the CEBAMA project aimed at providing a forum for discussion and dissemination of scientific and technical project results, preparing for periodic reporting and planning on future activities in CEBAMA. With CEBAMA being 6 months into the experimental R&D programme at present, the 1st Annual Workshop was organized as a cluster-meeting, integrating several different elements, i.e. reporting by Coordination Team, meetings within ExCom, exchange with EUG and meeting of the General Assembly. Parallel sessions of the three R&D oriented project workpackages (WPs) on the first day were used to discuss technical aspects related to the individual WPs and ensure good cooperation and exchange both within each WP, but also between WP1, WP2 and WP3. The key component of the workshop were the seven hours of scientific/technical oral presentations by the Beneficiaries from all WPs at the Plenary stage, focusing on presenting and disseminating first R&D results to the audience and discussing ongoing work. A separate poster session gave opportunity to present further R&D details and was a very productive forum for additional discussions and exchange among the participants. A specific Topical Session with invited speakers entitled “Lessons learned from previous and current projects on cementitious barriers” gave good insight into related projects of interest to the CEBAMA consortium. Talks were given M. Vuorio (on behalf of J. Hansen) on “DOPAS PROJECT: Experiences and lessons learned 2012-2016”, N. Michau “Results, lessons learned and residual uncertainties from the ECOCLAY II project”, and U. Mäder and V. Cloet “CI Experiment: Cement-Clay-Interaction. 5-year evolution of cement-clay interfaces”. About 30 S&T contributions prepared by the Beneficiaries based upon the presentations given at the Project Workshop are under review by WP leaders and the EUG. The S&T contributions and posters will be published in the 1st Annual Workshop Proceedings, documenting and disseminating R&D performed in Cebama. The Proceedings will be published at KIT Scientific Publishing and are available at the CEBAMA Website (www.cebama.eu) later in 2016. Also available at the Project Website are the submitted Public Deliverables which can be readily downloaded and are a source of additional information on the R&D performed in CEBAMA. The Issue No.1 of the CEBAMA Newsletter was published and distributed in February 2016 and is available at the Project Website or by using the following link. It was decided at the Barcelona meeting that the 2nd Annual Workshop of CEBAMA will be held in Finland on 3 days in the week of 15th-19th May 2017, hosted by VTT. The 2nd Annual Project Workshop will again be open to interested external participants and will be announced via email, or at the CEBAMA and IGD-TP Websites. 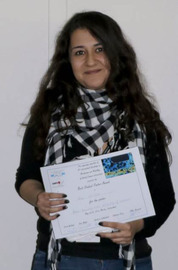 Nese Cevirim received the poster prize for her work on “Redox Chemistry and Solubility of Uranium in Alkaline to Hyperalkaline NaCl/KCl Systems”. The highly successful workshop was organized by EMPA, PSI and the University of Bern between May 22nd and 25th, 2016, in Murten, Switzerland, and was attended by over 100 international participants. 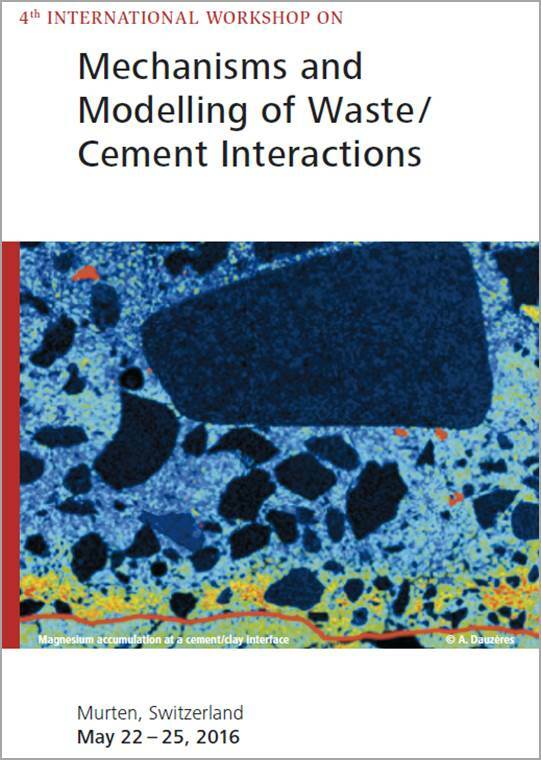 The workshop series “Mechanisms and Modelling of Waste/ Cement Interactions” focuses on the chemical understanding and the thermodynamic modelling of the processes responsible for the stabilization of hazardous and radioactive wastes in cementitious systems. Nese Cevirim received the poster prize for her work on “Redox Chemistry and Solubility of Uranium in Alkaline to Hyperalkaline NaCl/KCl Systems”. Based upon the studies, performed within her ongoing PhD which is integrated in the German BMWi funded EDUKEM project (02E11334C), a significantly improved description of uranium chemistry under the specific geochemical conditions expected for cementitious environments has been developed. T. Schäfer, R. Dohrmann, H.C. Greenwell (eds. 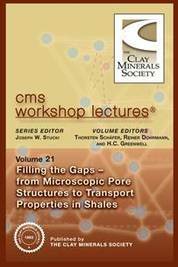 ): “Filling the gaps – from microscopic pore structures to transport properties in shales”, The Clay Minerals Society Workshop Lectures Series, Vol. 21 (2016), ISBN - 978-1-881208-46-4. 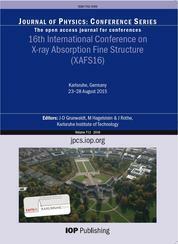 As a summary of five days full of cutting-edge X-ray science, the XAFS16 conference proceedings including 14 KIT contributions have just been published. 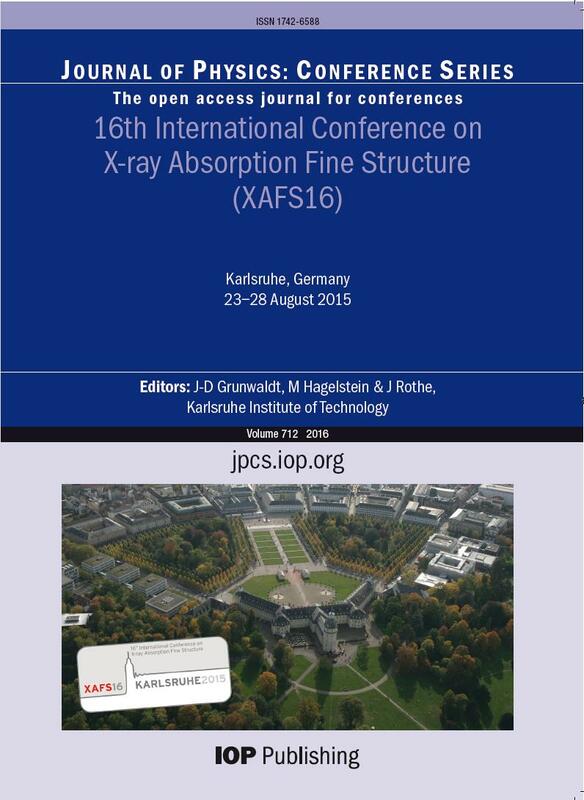 Completing the very successful 16th International Conference on X-ray Absorption Fine Structure with more than 550 participants held at KIT last year, the conference proceedings have just been published online. Based on XAFS16 keynotes, contributed talks, poster presentations and complementary workshops, the conference proceedings include 150 contributions grouped into nine scientific fields as well as results of the satellite meeting “Data acquisition, treatment, storage - quality assurance in XAFS spectroscopy” held at DESY in Hamburg. KIT with its institutes ANKA (now IBPT), IPS, INE and ITCP/IKFT as well as DESY helped creating an outstanding collection of state-of-the-art developments and applications in X-ray absorption spectroscopy and related techniques. Volume 712 of the Journal of Physics: Conference Series has been chosen to publish all contributions to the conference and related workshops and satellite meetings. All manuscripts have been rigorously reviewed and are available online free of charge in perpetuity. The volume covers all aspects of X-ray absorption spectroscopy, from the latest theoretical developments to instrumentation and applications. X-ray absorption techniques are applied for the benefit of an extraordinarily broad range of applications: in-situ characterization of catalytic reaction processes, environmental contaminant and radionuclide speciation, novel developments in medical applications and forensic analysis of cultural and historical objects – to name just a few. Results from the German synchrotron radiation facilities including KIT-ANKA are well represented in all topics. 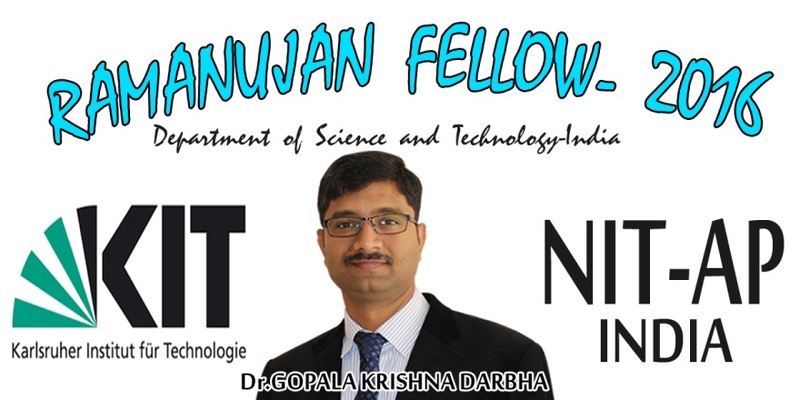 Dr. Gopala Krishna Darbha has been recently awarded the prestigious “Ramanujan Fellowship” by the Department of Science and Technology, India. Dr. Gopala Krishna Darbha was as a senior researcher at KIT-INE for five years (2011-2016) in the Geochemistry division where his main focus was to understand the transport of colloid(nanoparticles)-aided-contaminant transport in the subsurface environment. He has been recently awarded the prestigious “Ramanujan Fellowship” by the Department of Science and Technology, India. The fellowship is scientist-specific and very selective. It is aimed to attract highly skilled and brilliant researchers (Indian Nationals) working overseas in various cutting edge disciplines of Science & Technology, by providing them an attractive avenue to pursue their R&D interests in Indian institutions. For the 2016 year, only Dr. Darbha has been awarded the Ramanujan Fellowship in the Earth & Atmospheric Sciences division. KIT-INE congratulates him for his achievement wishing him all the best for his future endeavors and is looking forward for a successful collaboration between Germany and India to foster the sharing of knowledge in the field of science and technology. The guest from Nancy and the tour guides assembled for a group photo in front of the ANKA building. A group of 25 undergraduate students enrolled at the Materials Science and Engineering Department of the French elite university Ecole Nationale Supérieure des Mines de Nancy in Karlsruhe’s sister city took the opportunity to visit the KIT synchrotron radiation facility ANKA on the way back home from a one week excursion to several German research institutions. The group was accompanied by three supervisors, headed by Dr. Marc Ponçot, assistant professor at the Ecole des Mines and the Université de Lorraine in Nancy. A half day scientific program including lectures and an extended tour of the ANKA accelerator facilities, beamlines and laboratories was organized by scientists from the KIT Institute for Nuclear Waste Disposal (INE) and Institute for Accelerator Physics and Technology (IBPT), which is operating the ANKA storage ring and developing accelerator technologies for a future generation of synchrotron light sources. After a short introduction into KIT and its research portfolio, the little symposium on synchrotron technology and applications was opened by Patrick Schönfeldt, PhD student at IBPT, on “Accelerator Research at KIT-IBPT and ANKA”, followed by two INE contributions - an “Introduction to X-ray Absorption Spectroscopy” by Jörg Rothe and a “XAS investigation of the retention of radionuclides by secondary phases” by Nicolas Finck. 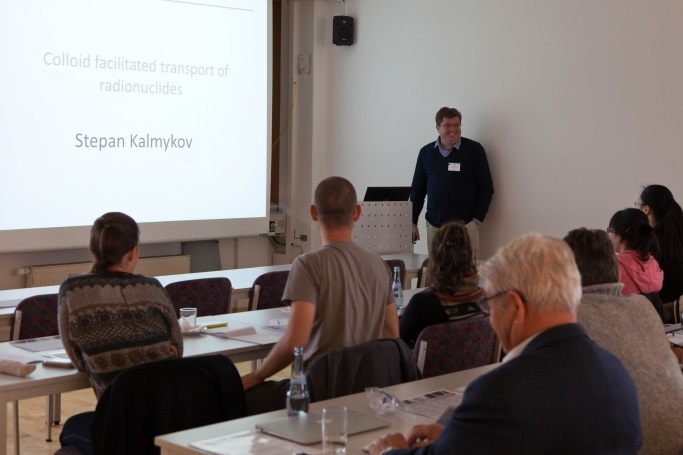 The latter lecture was highlighting the important role of synchrotron based XAS techniques to understand the behavior of radionuclides in a future nuclear waste repository. The last presentation was given by Martin Börner from the Institute of Microstructure Technology (IMT), an “Introduction to X-ray lithography with synchrotron radiation”. In this talk it was emphasized that the need to have all steps of the LIGA microfabrication technology - where IMT and its spin off companies are currently market leaders - on site at Campus North was the original motivation to establish the ANKA light source in Karlsruhe. Following this overview on different research fields at KIT which are strongly depending on the bright X-rays delivered by ANKA, an extended tour of the facility gave the opportunity for discussions with experts at beamlines and associated laboratories. The visit of the French guests ended with a joint lunch in the Campus North canteen. Special thanks to Bärbel Krause (IBPT) and Tonya Vitova (INE) who supported the ANKA tour. BioFeRad lecturers (left to right): Hyungjun Kim, Sungjun Bae, Jong- Il Yun, Thorsten Schäfer, Robert Polly, Woojin Lee, Daeseung Kyung, Ugras Kaplan. KIT- INE researcher visited KAIST (Korea Advanced Institute of Science and Technology) within the 1st Annual BioFeRad project (“Molecular-scale investigation of interaction mechanisms between uranium and iron-bearing minerals under diverse geochemical conditions of groundwater”) workshop on 26th January 2016 funded by the German Federal Ministry of Education and Research (BMBF) within the framework of the strategy of the German Federal Government for the internationalization of science and technology with Korea. The BioFeRad project is led by Prof. Woojin Lee (KAIST) and Prof. Thorsten Schäfer (KIT-INE). Specific topics discussed during the 1st Annual meeting focused on iron mineral surface induced redox reactions of organic and inorganic species and their kinetics, the spectroscopic characterization of uranium ternary complexes in solution and at the mineral surface and the system description by quantum chemistry, density functional theory (DFT) and molecular dynamic (MD) simulations. The second day the INE delegation was invited to KAERI (Korean Atomic Energy Research Institute) discussing ongoing and future collaborative activities with the group of Dr. Min-Hoon Baik especially in the field of radio- geochemistry and reactive transport modelling. The program included a visit of the hot lab facility and the extended Korean Underground Research Tunnel (KURT). More than a century after its discovery the structure of the Pa4+ ion in acidic aqueous solution has been investigated for the first time experimentally and by quantum chemistry. The combined results of EXAFS data and quantum chemically optimized structures suggest that the Pa4+ aqua ion has an average of nine water molecules in its first hydration sphere at a mean Pa–O distance of 2.43 Å. The data available for the early tetravalent actinide (An) elements from Th4+ to Bk4+ show that the An–O bonds have a pronounced electrostatic character, with bond distances following the same monotonic decreasing trend as the An4+ ionic radii, with a decrease of the hydration number from nine to eight for the heaviest ions Cm4+ and Bk4+. Being the first open-shell tetravalent actinide, Pa4+ features a coordination chemistry very similar to its successors. The electronic configuration of all open-shell systems corresponds to occupation of the valence 5f orbitals, without contribution from the 6d orbitals. Our results thus demonstrate that Pa(IV) resembles its early actinide neighbors. Just prior to the winter shutdown a significant milestone was reached in the commissioning of the new beamline for catalysis- and radionuclide research CatAct at the Karlsruhe synchrotron radiation source ANKA: the step-by-step alignment of the optical components, starting from the radiation source itself - a superconducting wiggler in the storage-ring – all the way to the high-precision mirrors which focus and guide the highly intensive X-rays to the two new experimental stations. The experimental stations themselves are located in two new laboratories: for “Catalysis research”, jointly operated by the KIT Institute for Technical Chemistry & Polymer Chemistry (ITCP) and the Institute for Catalysis Research and Technology (IKFT), and for “Actinde science”, operated by the Institute for Nuclear Waste Disposal. The two experimental facilities are operated alternately. In the first week of December 2015 the first X-ray absorption spectra were acquired from materials related to both research areas. One of the main research areas of ITCP/IKFT is the development of application-oriented catalysts, for example, as energy-storage materials for wind- and solar- generated power, or for purification of exhaust-gases, where due to increasingly stringent limits on exhaust-gas emissions for both diesel- and petrol-powered vehicles exhaust-gas catalysts are playing an increasingly important role (at present this consumes more than 50% of the available precious metal production, in particular Pt, Rh, and Pd.) The application of synchrotron radiation techniques makes it possible to investigate catalytic processes under real reaction conditions, which in turn allows the direct application of the results gained to current industrial and academic problems, for example in the design, fabrication and modelling of catalysts. X-ray spectroscopic measurements such as those carried out at the CatAct facility provide a unique insight into the electronic and atomic structure of the precious-metal constituents of these catalysts, making a key contribution to the optimization of their performance and consequent reduction in the usage of these expensive materials. The pilot experiments carried out on such platinum catalysts in December at CatAct are a foretaste of the research possibilities now available at the beamline: from early 2016 the new facility at ANKA will offer a worldwide unique experimental station and infrastructure targeted towards application-oriented investigation of catalyst systems, both for university and program-oriented research (SCI, STN, EE, and MML). Alongside current advancements in the production and processing of environmentally sustainable catalyst and energy storage materials, the safe, long-term storage of waste materials from nuclear power-generation represents a massive scientific, technical and societal problem. 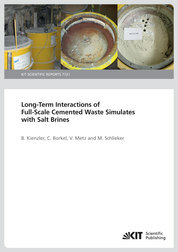 A scientifically sound and socially acceptable waste-disposal concept demands detailed understanding of the mid-term and long-term behaviour of highly active, heat-producing nuclear waste materials (in particular reactor fuel-rods and vitrified reprocessing residues) in intermediate and in future long-term geological repositories. Ensuring that these materials remain permanently isolated from the biosphere requires an understanding of their complex materials science, for example the relationship between chemical state and leaching-properties of uranium and other radionuclides in waste-glasses. Also in this field X-ray absorption spectroscopy delivers directly applicable results, as was illustrated by pilot-experiments on simulated, uranium-doped borosilicate nuclear waste glasses. 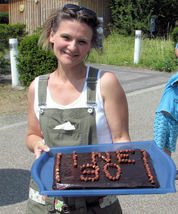 With a license to investigate radio-isotopes up to 106 times the exemption limit, the new ACT-Station at ANKA, together with the existing INE-Beamline and the direct proximity of the radionuclide laboratories of both INE and the European Commission’s Institute for Transuranium Elements (JRC-ITU), is recognized as presenting unique possibilities for safety research relevant for nuclear waste disposal at the European level. These facilities are available to both the national and international user community within the HGF NUSAFE program and via strategic research cooperation. Prof. Stepan Kalmykov (Lomonosov Moscow State University, Russia) starting his lecture during the training course. After a two day work package meeting of the EU 7th framework project CP BELBaR (Bentonite Erosion: effects on the Long term performance of the engineered Barrier and Radionuclide Transport) 20 PhD students or early-carrier Post-Docs from the United Kingdom (6), Finland (3), Czech Republic (3), Sweden (2), Germany (2), Spain (1), Belgium (1), China (1) and South Korea (1) working in the broad field of clay mineralogy, colloid chemistry and/or nuclear waste disposal research attended the CP BELBaR training course held at INE from 14th-16th October 2015. Introductory lectures were given by well-known experts in the field including e.g. Stepan Kalmykov (Lomonosov Moscow State University, Russia), Ivars Neretnieks (KTH, Stockholm, Sweden) and Tiziana Missana (CIEMAT, Madrid, Spain) followed by technical presentations and hands-on training on state-of-the-art analytical techniques available at INE suitable to characterize clays, clay colloids and the interaction of clay colloids with radionuclides. The practical units partly held in the controlled area included techniques such as Atomic Force Microscopy (AFM), Laser Induced Breakdown Detection (LIBD), Photon Correlation Spectroscopy (PCS), Streaming and zeta potential measurements, Flow Field Flow Fractionation (FlFFF), Environmental Scanning Electron Microscopy (ESEM) and Time Resolved Laser Fluorescence Spectroscopy (TRLFS). The training course ended with a visit of the ANKA Synchrotron radiation facility at KIT with a special focus on the INE beamline. Am 08. Oktober 2015 besuchten die Parlamentarische Staatssekretärin beim BMUB Rita Schwarzelühr-Sutter und die Regierungsdirektorin im Referat RS III 2 (Grundsatzangelegenheiten der nuklearen Entsorgung, Standortauswahl Endlagerung) Mechthild Caspers im Rahmen eines Besuchs am KIT das Institut für Nukleare Entsorgung um sich einen Überblick der Forschungsarbeiten rund um das Thema Endlagerung zu verschaffen. Im Kontrollbereich des INE informierten sich die Staatssekretärin und die Regierungsdirektorin umfassend über die experimentellen Arbeiten. The Helmholtz Young Investigators Group at INE was excellently evaluated! The interim evaluation of the Helmholtz Young Investigators Group “Advanced synchrotron based systematic Investigations of actinide and lanthanide systems to understand and predict their reactivity” led by Tonya Vitova was recently completed by an independent external review committee and the KIT Council for Research and Promotion of Young Scientist (KIT-CRYS). The achievements of the group were highly recognized and designated “mit sehr gutem Erfolg” (c.f. 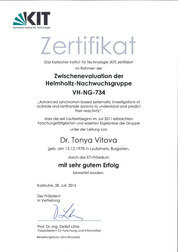 certificate and link to the web site of the group). The Helmholtz Young Investigators Group (HYIG) “Advanced synchrotron based systematic investigations of actinide (An) and lanthanide (Ln) systems to understand and predict their reactivity” led by Tonya Vitova designed, installed and commissioned a multi-analyzer Johann type X-ray emission spectrometer (MAC-spectrometer) at the INE-Beamline for actinide research at the ANKA synchrotron radiation facility, Karlsruhe, Germany (cf. “Instrumentation” in http://www.ine.kit.edu/945.php). The set-up was recently optimized for actinide (An) M4,5 edge high energy resolution X-ray absorption near edge structure (HR-XANES) and X-ray emission spectroscopy (XES)/resonant inelastic X-ray scattering (RIXS) (cf. Figure) experiments in collaboration with the Synchrotron radiation group and the workshop of INE. This instrument, combined with access to the controlled area laboratory at INE in close proximity, is worldwide unique, enabling An M4,5 edge HR-XANES and XES/RIXS investigations of solid and liquid phase radioactive materials, including those under extreme conditions. For the first time ever U, Np and Pu M4,5 edge HR-XANES and RIXS studies of genuine nuclear waste glass, spent nuclear fuel and aqueous solutions containing various Pu oxidations states were recently performed (cf. “Highlights” in http://www.ine.kit.edu/945.php). *BRGM, D3E/SVP, 3 avenue Claude Guillemin, 45060 Orléans cedex 2, France. E-mail: c tournassatXch6∂brgm fr. Phone: +33 2 38 64 47 44. Fax: +33 2 38 64 30 62. 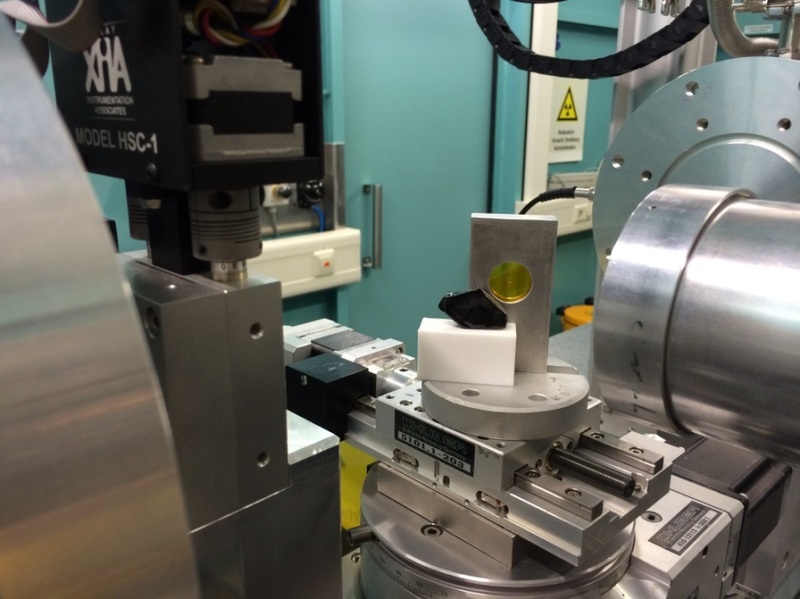 The specially designed sample holder loaded with a HAWC glass fragment is mounted on the positioning stage inside INE-Beamline experimental hutch – a block of inactive reference glass is positioned in front of the radioactive HAWC sample. XAFS and XRF techniques available at the ANKA INE-Beamline for radionuclide science have been successfully applied for the investigation of a borosilicate type HAWC glass obtained during the industrial vitrification process at the former Karlsruhe reprocessing plant. The emphasis of this initial study was to obtain the speciation - i.e., the physical and chemical state - of various actinides and fission products immobilized in the glass matrix - a prerequisite to understand and predict their possible release and remobilization following corrosive waste glass degradation in a deep geological repository. This investigation marks the first time ever that such a material has been transferred to and analyzed at a synchrotron X-ray beamline experimental station – possible due to the close proximity of INE radiochemical labs operating a shielded box line and the ANKA synchrotron facility on KIT Campus North. 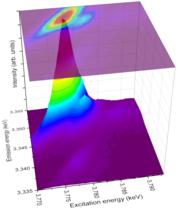 The study has been recently published in Journal of Nuclear Materials - http://dx.doi.org/10.1016/j.jnucmat.2015.02.021. Am 04. und 05. März 2015 fand das erste Helmholtz-Koordinierungstreffen nach der PoF-III-Begutachtung im vergangenen Jahr statt. Im Rahmen des Programm-Topics ‚Nuclear Waste Management‘ trafen sich Vertreter des Forschungszentrums Jülich (IEK-6: Institut für Energie- und Klimaforschung - Nukleare Entsorgung und Reaktorsicherheit), des Helmholtz-Zentrums Dresden-Rossendorf (IRE: Institut für Ressourcenökologie) und des Karlsruher Instituts (INE) im Forschungszentrum Jülich um den Status Quo sowie das weitere strategische Vorgehen innerhalb des Programm-Topics zu diskutieren. Wie aus einer Pressemitteilung des Ministeriums für Umwelt, Klima und Energiewirtschaft in Stuttgart zu entnehmen, kam es am vergangenen Samstag, 10. 05. 2014 bei Dacharbeiten im Institut für Nukleare Entsorgung (INE) am KIT-Campus Nord zu einem Schwelbrand an der Abdichtung einer Dehnungsfuge zwischen zwei Gebäudeteilen. Der dabei entstehende Rauch wurde über die Zuluftversorgung in den Kontrollbereich des Instituts angesaugt. Der Schwelbrand wurde rasch gelöscht. Bei einem in der Nacht zum Sonntag auftretenden Starkregen drang Regenwasser durch die nur provisorisch verschlossene Dehnungsfuge ein. Anders als verschiedentlich in der Presse berichtet, gelangte das Wasser nicht in radiochemische Labors sondern in einen Gebäudeteil außerhalb des INE-Kontrollbereichs. Dort führte das Wasser zu einem Kurzschluss in der Stromversorgung, an der sowohl die Abluftanlage sowie die Abluftüberwachung des Kontrollbereichs angeschlossen sind. Feuerwehr und technisches Personal des KIT behoben innerhalb kurzer Zeit den Schaden. Während des gesamten Zeitraums hielten sich keine Personen im Kontrollbereich auf, der überdies nachts und am Wochenende geschlossen ist. Es erfolgte keinerlei Freisetzung von Radioaktivität. Die Abluftanlage des INE Kontrollbereichs dient dazu, einen Unterdruck in den Labors zu erzeugen. Damit wird sichergestellt, dass eine mögliche Radionuklidfreisetzung aus Versuchseinrichtungen in den dafür speziell eingerichteten radiochemischen Labors direkt in die Abluftfilter gelenkt und dort zurückgehalten wird. Sie dient daher primär dem Arbeitsschutz. Eine Gefährdung von Umwelt und Personen außerhalb der Labors kann daher bei einem Ausfall der Anlage ausgeschlossen werden. Der INE-Kontrollbereich unterliegt der Überwachung von Behörde und TÜV. Die radiochemischen Labors des INE sind mit einzigartigen Experimentiereinrichtungen ausgestattet, die es erlauben, das Verhalten von radioaktiven Reststoffen und endlagerrelevanten Radionukliden in Endlagersystemen zu untersuchen. Wissenschaftler des INE erarbeiten grundlegende Forschungsbeiträge, die vor dem Hintergrund des in Deutschland anlaufenden Standortauswahlverfahrens dringend benötigt werden. Der Endlagerforschung im KIT-INE wurde wiederholt durch hochrangige internationale Expertengremien eine außerordentlich hohe Qualität attestiert. Vom 24. bis zum 26. April fand in Goslar das Kick-off Treffen der Forschungsplattform ENTRIA statt, die von der Niedersächsisch Technischen Hochschule (NTH) koordiniert wird. Teilnehmer waren Vertreter der 13 Partnerorganisationen, darunter auch der KIT Institute INE und ITAS, die in einem Zeitraum von fünf Jahren Optionen für die Entsorgung radioaktiver Reststoffe vergleichen und bewerten sollen. Dabei handelt es sich um die tiefengeologische Endlagerung mit und ohne Rückholoption sowie die oberflächennahe Langzeitzwischenlagerung. Neuartig an diesem Projekt, das vom BMBF über den Projektträger Karlsruhe (PtKa) finanziert wird, ist die interdisziplinäre und ganzheitliche Herangehensweise an die Thematik: Naturwissenschaftler, Techniker, Ingenieure diskutieren mit Sozialwissenschaftlern, Philosophen und Juristen über das Problem der nuklearen Entsorgung. Bereits beim ersten Treffen wurden aus den verschiedenen Blickwinkeln interessante Aspekte und neue Sichtweisen eröffnet. Alle Beteiligten empfanden das Treffen übereinstimmend als außerordentlich spannend und inspirierend. Positiv auch die Tatsache, dass viele junge Wissenschaftler/innen an den Projekten mitarbeiten. Das INE – anfangs hieß es noch Institut für Nukleare Entsorgungstechnik – wurde im Jahr 1980 im damaligen Kernforschungszentrum Karlsruhe gegründet. Zu dieser Zeit war in Deutschland die Wiederaufarbeitung von abgebranntem Brennstoff aus Kernreaktoren als einziger Entsorgungsweg vorgeschrieben. Bei der Wiederaufarbeitung werden Plutonium und Uran von den bei der Kernspaltung entstandenen Spaltprodukten abgetrennt und wieder zur Stromerzeugung eingesetzt. Die verbleibenden radioaktiven Abfälle müssen dann so behandelt werden, dass man sie sicher endlagern kann. Mit dieser Thematik befasste sich das damals technologisch ausgerichtete INE in den achtziger Jahren. Es wurden sowohl Methoden untersucht, mit denen die Menge an radioaktiven Abfällen deutlich verringert werden konnte, als auch Verfahren entwickelt, mit denen stabile, für die Endlagerung geeignete Produkte hergestellt und getestet werden konnten. Nach dem Verzicht auf die Wiederaufarbeitung in Deutschland im Jahre 1989 musste sich das Institut neu orientieren. Der Schwerpunkt der Forschungsarbeiten wurde nun auf die Langzeitsicherheit der Endlagerung ausgerichtet. Von den technologisch orientierten Themen wurden nur die Arbeiten zur Verglasung hochradioaktiver Abfälle weitergeführt. Die im INE entwickelte Schmelzofen- und Prozesstechnologie ist das Herzstück der Verglasungsanlage Karlsruhe, mit der die hochradioaktiven Abfälle der Wiederaufarbeitungsanlage Karlsruhe erfolgreich in stabile, endlagergerechte Produkte überführt wurden. Die Endlagerung radioaktiver Abfälle liegt in Deutschland in der Verantwortung des Bundes. Im Rahmen der gesellschaftlichen Vorsorgeforschung kümmern sich die Wissenschaftler aus dem INE um die hochradioaktiven Abfälle, für die es bis heute weltweit kein betriebsfähiges Endlager gibt. Die hochradioaktiven Abfälle machen zwar nur etwa 5 Prozent des Gesamtvolumens aller radioaktiven Abfälle aus, sie enthalten aber 99 Prozent der Radioaktivität. Im Mittelpunkt der Sicherheitsforschungen steht das Verhalten der langlebigen Actiniden (z. B. Plutonium, Americium und Neptunium) unter Endlagerbedingungen, weil diese Radionuklide über sehr lange Zeiträume das Gefährdungspotenzial der Abfälle bestimmen. Langzeitsicherheitsanalysen für Endlager erfordern belastbare Voraussagen zur etwaigen Freisetzung von Radionukliden über sehr lange Zeiträume (hunderttausende von Jahren). Um solche Voraussagen machen zu können, müssen die Prozesse, die die Mobilität dieser Elemente bestimmen, auf molekularem Niveau verstanden sein. Diese Erkenntnisse lassen sich dann auf natürliche Systeme übertragen. Das INE verfolgt genau diesen Forschungsansatz, indem grundlegende Untersuchungen zur Chemie der Actiniden und anwendungsorientierte Untersuchungen in Untertagelabors miteinander verknüpft werden. Da in Deutschland noch keine Entscheidung über den Standort für ein Endlager für hochradioaktive Abfälle getroffen wurde, sind alle derzeit international diskutierten Wirtsgesteinsformationen für Endlager (Salz, Granit, Ton) in die Untersuchungen einbezogen.Solche Untersuchungen sind sehr aufwendig und anspruchsvoll. Deshalb ist die Entwicklung von experimentellen und analytischen Methoden zur Bestimmung von Actiniden im Spurenkonzentrationsbereich ein weiterer Schwerpunkt der Forschungen. Zusammen mit den radioaktiven Labors und den extrem leistungsfähigen analytischen Methoden im INE steht dem KIT eine weltweit einmalige experimentelle Infrastruktur zur Verfügung, die in Verbindung mit der großen Expertise der INE-Wissenschaftler im Bereich der Actiniden ein Alleinstellungsmerkmal darstellt. Dies zeigt sich auch an dem großen internationalen Interesse. So ist das INE in dem von der EU geförderten ACTINET-Projekt eine der großen europäischen Institutionen, an denen Gastwissenschaftler und Doktoranden aus ganz Europa Actinidenforschung betreiben können. Da der Leiter des INE, Prof. Dr. Horst Geckeis, gleichzeitig einen Lehrstuhl für Radiochemie am KIT-Campus Süd innehat sind das Institut und seine Mitarbeiter eng in die Ausbildung von Studenten und wissenschaftlichem Nachwuchs auf dem Gebiet der Nuklearchemie eingebunden. Darüber hinaus sind Wissenschaftler des INE an den Universitäten Berlin, Heidelberg, Mainz und Jena in die Lehre und Ausbildung tätig. Der wissenschaftliche Nachwuchs wird in diesem interessanten Forschungsbereich gebraucht. Denn die Sicherheit der nuklearen Entsorgung muss unabhängig von Ausstiegsszenarien gewährleistet sein. Und eine in letzter Zeit immer häufiger diskutierte Renaissance der Kernenergie wird es nur mit dem Nachweis der sicheren Entsorgung geben.